Increasing worldwide interest in single malt whisky is fuelling a boom in new distillery builds across Scotland, with several set to open in the year ahead. Becky Paskin explores the outlook for a new wave of malt whisky distilleries. If there’s one beacon of hope guiding us into the New Year, it’s that our choice of single malt Scotch whisky is about to get a whole lot more diverse. Since 2013 Scotland has welcomed 14 new whisky distilleries, from Harris in the Outer Hebrides down to Glasgow in the Lowlands. Two distilleries fired up their stills for the first time in the last 12 months alone: InchDairnie in Fife began production in May, making two different single malts, while Torabhaig on the Isle of Skye became operational in December. As we move into 2017, investment in Scotch whisky is only expected to continue, with 20 new distilleries projected to open within the next 24-36 months, including Edinburgh’s first malt distillery in 92 years, Islay’s ninth distillery and Arran’s second. This year alone will see the launch of at least seven new distilleries, as well as the regeneration of a silent Lowland favourite. It will also be a year of firsts – the first distillery in the Borders for 180 years, the first legal distillery on the Isle of Raasay, and the first distillery to be launched solely by a woman. While their whisky won’t be available for several years yet, the anticipation of the next wave of Scotch distilleries opening in 2017 should whet more than a few appetites. It’s been silent since 2009, but this year will see the return of Scotland’s most southerly distillery under its 11th owner. Bladnoch has a chequered history of takeovers, renovations and long silent periods – the distillery was first erected in 1817 on the McClelland farm in the hamlet of Bladnoch in the south-east of Scotland, and since that time has seen 10 owners come and go. In 2015 it was purchased by Australian yoghurt entrepreneur David Prior, who has completely renovated the site with the intention of producing malt spirit by May 2017 – just in time to celebrate Bladnoch’s 200th anniversary. Find out more about Bladnoch distillery. July 2017 will be a momentous month for the people of Hawick, as the town welcomes the first malt whisky distillery in the Borders for 180 years. The £10m Borders distillery, situated in a former factory in Hawick town centre, will have the capacity to produce up to 1.8m litres of spirit per year. While we’ll have to wait some time for the first malt whisky release, expect a Borders gin, made using local botanicals, in the near future. Find out more about Borders distillery. Glasgow was once a booming whisky distilling and blending hub, but by the start of the 21st century production in the city had reduced to a murmur, the only whisky distillery in operation being the Chivas Brothers-owned Strathclyde grain plant. In 2014, after an absence of 112 years, malt whisky distilling returned to the city with the opening of the Glasgow distillery in Hillington. Meanwhile, the construction of a second, independent distillery was also under way at the historic Queen’s Dock. 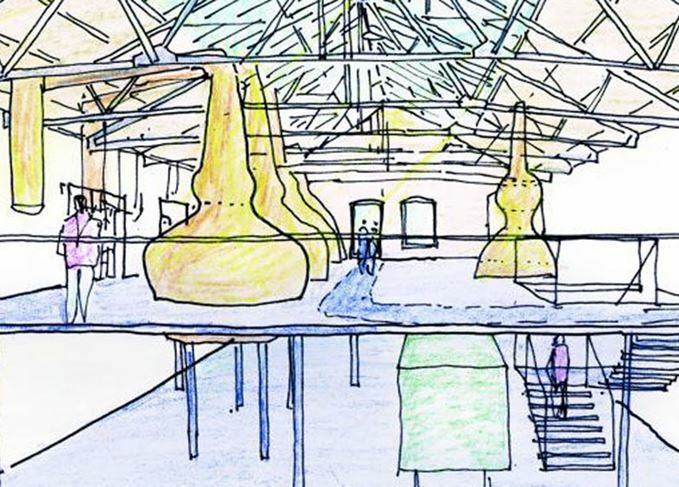 Morrison Glasgow Distillers (MGD), led by whisky veteran Tim Morrison, plans to transform the old 19th-century Pump House into a £10.5m single malt distillery named Clydeside. Situated in the heart of Glasgow’s famous docks, the distillery will open this autumn, featuring a café/restaurant and ‘interactive whisky experience’ with tours and tastings offered to the 65,000 visitors expected every year. While Clydeside’s malt whisky is expected to be light and fruity in the typical Lowland style, MGD has hinted at a spicier Speyside style to reflect Glasgow’s former glory days of tobacco and spice shipping. Find out more about Clydeside distillery. March 2016 saw brothers Simon and Phil Thompson launch a crowdfunding campaign to transform a 135-year-old fire station into a microdistillery. The directors of the family-owned Dornoch Castle Hotel in Sutherland were overwhelmed with pledges and eventually obtained their licence to distil in December. The brothers have been running test mashes, fermentations and distillations, but won’t complete a run of spirit to lay down as single malt whisky until early 2017. Their plan is to eventually produce a ‘traditional’ malt spirit made using heritage varieties of floor-malted barley, brewers’ yeast, long fermentations in oak washbacks and direct-fired distillation. Find out more about Dornoch distillery. Along with being a working farm, holiday accommodation provider and wedding venue, the historic Drimnin Estate in Argyll is also set to become a distillery early this year. Drimnin's distillery – the name is yet to be confirmed – is run separately to the estate but will occupy the farm steadings adjacent to Drimnin House, and will ‘explore the limits of what whisky from Scotland can be’. An on-site visitor centre will offer tastings and tours, including lunch in a converted greenhouse with ‘spectacular’ views of Tobermory and Mull. This year sees the first legal distillery launch on the Hebridean island of Raasay. It’s the first of two new projects for R&B Distillers, the second of which will eventually be a site in the Borders. For now, Isle of Raasay distillery – which is expected to be operational by the summer – is expected to produce a signature whisky with a fruity, sweet and lightly peated character, as seen in its pre-emptive release, Raasay While We Wait. However, the distillery’s configuration allows for plenty experimentation with fermentation in distillation, allowing for a variety of styles. Yes, there will be a visitor centre – the island is just a hop away from Skye and its two distilleries (Talisker and Torabhaig) – complete with overnight accommodation for members of the distillery’s Na Tusairean whisky club. Find out more about Isle of Raasay distillery. The first recorded mention of Scotch whisky is in the Exchequer Rolls of 1494, where Friar John Cor is asked to make aqua vitae for King James IV. Cor is reputed to have resided at Lindores Abbey in Fife, a now derelict building often referred to as the ‘spiritual home of Scotch whisky’. Now, some 500 years later, distilling is set to return to the area – across the road in fact – at Lindores Abbey distillery, with a mixture of traditional and modern production processes. Barley will be mostly sourced from the 60 acres of farmland surrounding the site, with some dried using peat. The distillery will feature a modern, on-site warehouse with partly-heated sections allowing the team to experiment with speed of maturation. The distillery is set for completion in September 2017 and, while its first whisky won’t be ready for some time, Lindores Abbey will release an unaged aqua vitae later this year. Find out more about Lindores Abbey distillery. Construction is yet to start at this microdistillery situated at the Fearn Aerodrome near Tain, but Toulvaddie is expected to be operational by May this year. Somewhat unbelievably, considering the long history of distilling in Scotland, it will be the first whisky distillery founded solely by a woman. Heather Nelson – who will fund and operate the distillery herself with the assistance of a brewer – intends to produce a light, ‘easy-drinking’ whisky in the style she likes to drink, with both peated and unpeated expressions eventually available. A limited number of 70-litre casks to be filled in Toulvaddie’s first year are already available to purchase for £2,000 each, while whisky incentives are available to those wishing to join the Distillery Founders’ Club. Find out more about Toulvaddie distillery. The independent bottler is to build its own £10m whisky distillery on the banks of the Clyde. Groundhog Day for Scotch distillery boom? The surge in new Scotch distilleries has some striking similarities to the Victorian whisky boom. The £6.5m heritage centre and distillery will celebrate the whisky heritage of the area. Islanders are increasingly conflicted about the impact of the whisky boom, says Scott MacCallum. With poor ferry links and crumbling roads, ‘whisky island’ faces a number of challenges.